Fiberglass Materials - What you need, and what you must know! - VIDEO - Car Audio Fab - Car Audio Resources | The original Car Audio Forum. Ever wondered, what weight chop mat should I use? What resin do I need? How much hardener (MEKP) do I need to add to the resin? What is it is hot? What if it is cold? Whats the best way to use fiberglass and add strength to something? As i gear up for my door pod build I have been amassing some more fiberglass fabrication products. These products are typical of what you would see in any car audio install that involves fiberglass show I wanted to share them with you, along with an explanation of each and some answers to questions I see repeatedly online! Enjoy! 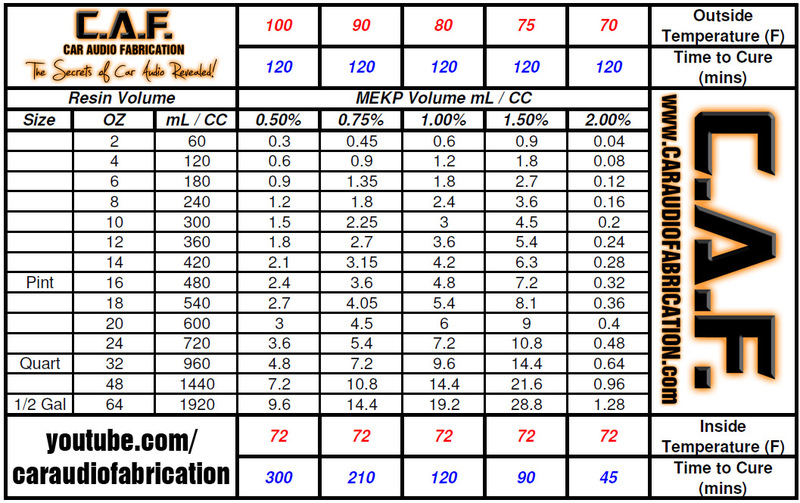 Also, here is a wonderful table that allows you to better understand how much MEKP to add to your mix.